What’s more alarming than that record, however, is the complete lack of desire, compete, and effort they’ve exhibited in those games. 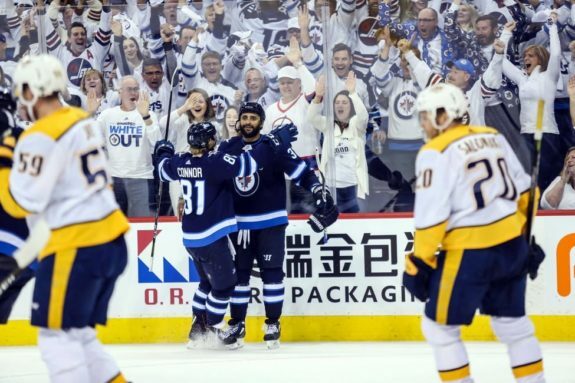 Since the win over the Predators, the Jets have looked nothing like the Stanley Cup contender they’re purported to be and are playing nowhere near their station considering the loads of talent they possess. Even describing them as “average” over their past five games would be extremely charitable. They can be more accurately described as pretty pathetic. It would be one thing if they were battling hard and just falling short, but this has simply not been the case. Other than Monday’s 4-3 win against the Chicago Blackhawks, their performances have been lifeless and listless; bereft of speed, creativity, and energy. They’ve been outscored 21-12, their power play has had very little power, their five-on-five play has been as The Athletic’s Murat Ates described, “objectively bad,” and their puck possession and shot attempt metrics have been near the league’s basement. “They haven’t shown very much of a commitment to playing a style of game that is going to be successful in the playoffs,” TSN hockey analyst Ray Ferraro said Wednesday afternoon. Most recently, the Jets were hammered 5-1 by the Minnesota Wild, who completed the sweep of the five-game head-to-head series. Prior to the game versus the Blackhawks, they basically no-showed against the Montreal Canadiens in a 3-1 loss, blew a 4-2 third-period lead to the New York Islanders and lost 5-4 in regulation, and only showed up for the final frame in a 5-2 defeat at the hands of the Dallas Stars. Any hockey team is only as good as its leaders. Unfortunately, those whose role it is — and those who are paid well to — lead by example and lead the Jets to the promised land look lost in the desert. The Jets’ top trio especially — usually known for being consistently dangerous with the puck, their ability to create chances both off the rush and on the cycle, and their innate knack for knowing exactly where each other are on the ice — have been ineffective. Captain Blake Wheeler established a new franchise record for assists in a season with 70 on Tuesday, but only has two points in his past five games. Mark Scheifele has 36 goals, but just one tally in his past five and three points in his past 10. He’s looked sluggish and a step behind since mid-March. Kyle Connor has two points since his hat trick, but none in the past four games. Bryan Little’s been invisible, riding an 11-game pointless streak. The Jets’ top-six young guns haven’t fared much better. 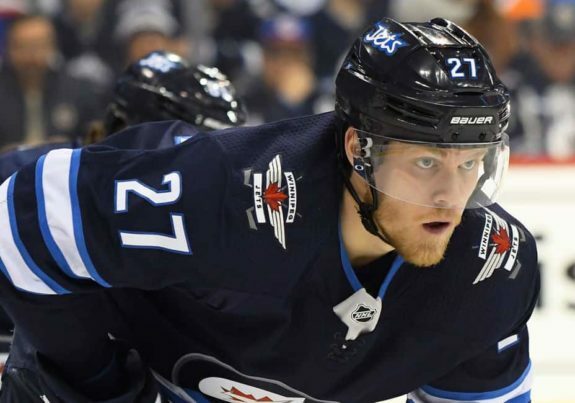 Nikolaj Ehlers is on a seven-game pointless streak and Patrik Laine has just six goals since the New Year and one in his past 17 games; he’s fallen away from his emerging role as a playmaker since being separated from Wheeler and Scheifele. Head coach Maurice has tried bringing out his patented line blender to get things going, but it hasn’t created anything that’s a good mix. The only players really producing — or that seem to be hustling — right now are deadline-day addition Kevin Hayes, who has 12 points since joining the Jets, Jack Roslovic, who is playing some of his best hockey of the season since being scratched for three straight games in favour of Matt Hendricks, and Andrew Copp, who always exhibits maximum effort. Me: the Winnipeg Jets have become a line 4 team. A rational response: you mean 4 line team? They're deep? Me: no I mean the drivers are on holiday and Andrew Copp is pushing the whole dang bus. Having nearly everyone so inexplicably cold at the same time indicates something wrong with the team’s collective psyche; it seems they simply haven’t been able to cultivate the inner desire needed to succeed since clinching. At least the Jets have recognized their play cannot continue. They held a closed-door meeting Tuesday night, one that left media members waiting outside the room for nearly half an hour. It was a players-only meeting, and Wheeler — the only Jet who spoke to the media — was vague about what was discussed in the Xcel Energy Center’s visitor’s dressing room. …Or Is the Team Doomed to Crash? 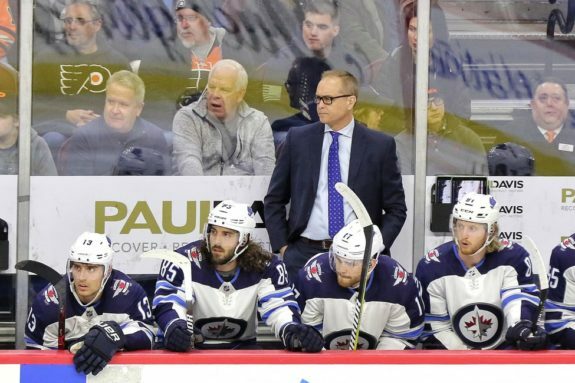 Whatever the talk entailed, it needs to have the effect of lighting an immediate fire under the Jets’ collective behind, or else they’re in huge trouble. If the conversation has the desired effect and the Jets manage to capture wins in their final two games against the Colorado Avalanche and Arizona Coyotes, they will at least enter the postseason with a modicum of momentum. This heart-to-heart, though, may be too-little-too-late. One week before the playoffs is obviously not the ideal time to realize your team has profound problems, nor is it a lot of time to fix them. 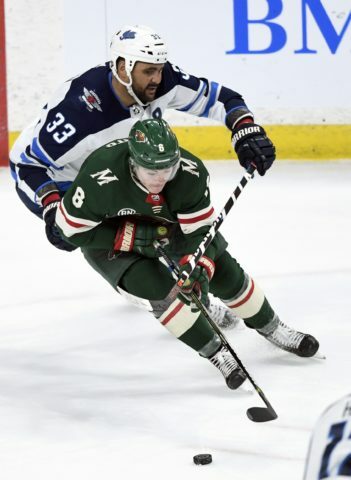 Dustin Byfuglien’s return to action hasn’t boosted the team’s fortunes as much as this author thought it would, nor has the addition of the veteran Hendricks — ostensibly a move to inject character and leadership into the room — had much effect either. One thing is certain: the Jets desperately need to find a higher gear and fast. If the heart-to-heart doesn’t stick and they go into the playoffs with their current quality of game in tow, their Cup chase will be a short one — they’ll be unlikely to advance past the first round, regardless if their opponent is the Dallas Stars, Predators, or Blues. And given the talent the Jets undoubtedly possess and that their window to hoist Lord Stanley’s Mug is never more open than it is right now, that would be simply a colossal failure.